In 2015, I completed leader training with Ramblers Worldwide Holidays (RWH) which was a requirement of leading an autumn Tour du Mont Blanc trip. I’d never visited the Alps before but French legislation required International Mountain Leaders to lead on the French section of the TMB or groups would not be allowed on the route. 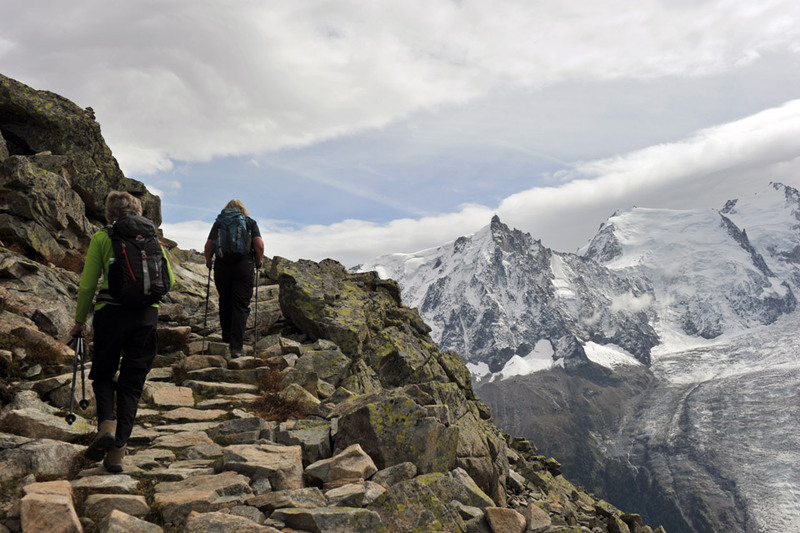 The Tour du Mont Blanc or TMB is one of the most popular long-distance walks in Europe. It circles the Mont Blanc massif, covering a distance of roughly 170 kilometres (110 mi) with 10 kilometres (6.2 mi) of ascent/descent and passes through parts of Switzerland, Italy and France. Each day is different, yet each one provides walking along high alpine paths and views over peaks and glaciers and is a walk which can be enjoyed by keen walkers with a reasonable level of fitness. The trip I led in September was a hotel based trek which meant rather than staying overnight in mountain lodges, we would pass these during the day and enjoy more comfortable valley hotels at night. This made for a very enjoyable trip in my opinion. Because of my unfamiliarity with the route I travelled out ahead of my group to recce some of the route and hotels we’d be using. I drove to Chamonix but the group flew out and I met them at Geneva Airport for the drive to Argentiere, just north of Chamonix. Our TMB would be in a clockwise direction with rest days in Courmayeur and Les Houches. Rohan clothing formed the basis of my TMB wardrobe with Expedition Shirts and Trailblazer Convertible trousers being my daily outfit. Additionally, I used some merino tops and the hat featured in my profile picture. RWH graded the walk as Grade C where walks are between 6 - 7 hours a day. Grade C+ walks can be up to 7 hours a day, with occasional easy scrambling for the experienced hiker. Experience of harder terrain, scrambling and some exposure is useful and there were some fixed ladders and wires to hold onto. Daily walks are normally of 10–15 miles and generally include ascents of between 2,500 and 4,500ft (800–1400m). However, the rest stops at Courmayer and Les Houches give plenty of opportunity to recover from the days in between those towns. The highlight of this trip was really about visiting a new area and being personally challenged to ensure I led the group around the TMB so that they all completed the route. I always enjoy a challenge of visiting a new mountain area and ensuring those with me gain the satisfaction of having achieved something special to them. Of the three countries visited, I enjoyed the Italian section the most, from the time we crossed into Italy over the Grand Col Ferret (2,537m) to spending 3 nights in Courmayer until we left Italy again over the Col de la Seigne (2,512m). I can highly recommend the Hotel Bouton d’Or in Courmayer who summarise the TMB as “3 countries, one single identity, 10,000 metres elevation difference, 60 hours of walking, 170 km of discovery that all adds up to a total of 10 days pure satisfaction” for which I wholeheartedly agree!